Abstract: The progress of investigations concerning the Pieniny Klippen Belt in the last twenty years is discussed and the actual state of opinions about its evolution presented. This most complicated zone of the Western Carpathians is remarkable for the complete separation of the unknown Paleozoic-Triassic basement from the Jurassic-Cretaceous strata. A nappe pile from shallow-water as well as deep-water successions resulted from the first compression. More rigid Jurassic-Lower Cretaceous limestones were during the following transpression torn of in the lenses (klippen) amidst the plastic sediments of the Upper Cretaceous strata („envelope”). A critical analysis of 15 successions (and their varieties) discerned up till now in the Slovak segment is given and their mutual position within the ancient sedimentary area is discussed. The following problems remain open: the origin of the exotic material in the Cretaceous and Paleogene conglomerates, the existence of a transform possessing oceanic crust, the place of Haligovce, Nizna and Michalova Hora Successions in the sedimentary area, the presence of the Magura Successions (Grajcarek Unit) on the Slovak territory, the possible provenance and transport of the Manin, Drietoma and Kostolec Successions from the Central-Carpathians nappes. Abstract: The Vysoka Formation limestone sequence (Fatric Zone, Central Western Carpathians) reflects two striking contradictions in the character of the Anisian sedimentary record. Tempestite intercalations representing the first one are connected with the occurrence of violent storm events which interrupted the overwhelmingly stable sedimentary conditions of a restricted shallow carbonate ramp environment. The second contradiction (tsunamite layers) proves the occurrence of sudden seismic events which disturbed a long period of rather slow (20–30 mm/Ka) gradual subsidence. These events are interpreted as the effects of starting the oblique rifting of the Paleo-European shelf. 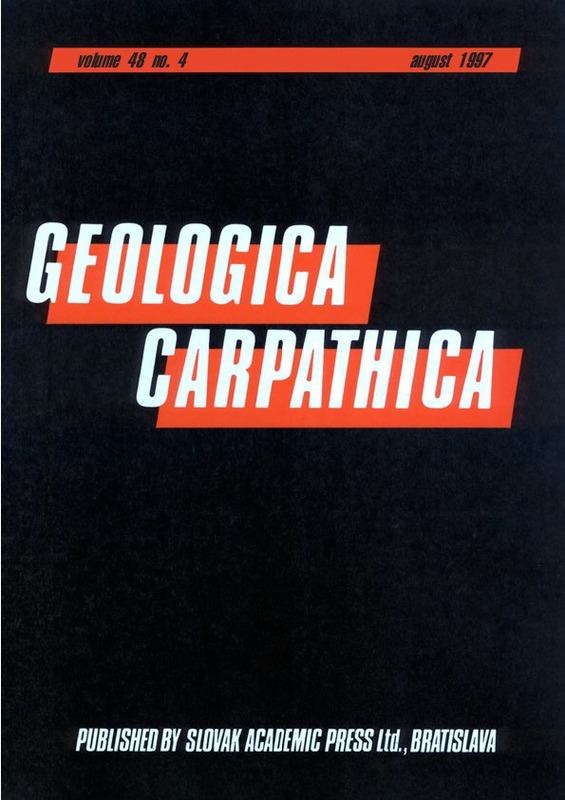 Abstract: Several decades have already passed since the period of the basic geological-stratigraphic research on the Lower Cretaceous formations of the Western Carpathians by Dimitrij Andrusov. The first part of this work looks at the existing state of internationally recognized ammonite stratigraphy on the level of ammonite zones and horizons (subzones) and the placing of boundaries between stratigraphic stages and substages. The second part attempts to summarize recent findings from the area of ammonite stratigraphy of the ammonite-bearing Lower Cretaceous formations in the western part of the Outer and Central Carpathians, occurring on the Czech and Slovak territories.The summary is based above all on the author´s own collections in the field, his systematic study and revision of the older material and also on the results of cooperation with other specialists. Abstract: Silicified sediments, which occur from the Albian to the Campanian in the Czorsztyn Succession of the Pieniny Klippen Belt are known in several stratigraphic horizons in Slovak and Polish territory.The studied section, situated in Vrsatec Castle Klippe contains the sediments of ? Upper Berriasian-Lower Campanian age. The silicified sequence is represented by cherty limestones and silicified marls with rich assemblages of foraminifers (Helvetoglobotruncana helvetica Zone) and radiolarians (Superbum Zone sensu O’Dogherty 1994) of Early Turonian (except for the lowermost part)-? Middle Turonian age. The new radiolarian species Patellula andrusovi Ozvoldova, n.sp. was described there. Abstract: The site of Lipovany situated in South Slovakia near Lucenec has yielded new plant fossils including 1 bryophyte, 2 ferns, 2 conifers and 27 angiosperms. The vegetation corresponds to evergreen notophyllous/microphyllous broad-leaved forest suggesting subtropical humid conditions. Instead of the previous stratigraphical interpretation (Ottnangian), the age of the locality is older, i.e. the Eggenburgian according to new radiometric data. The nearest locality, Ipolytarnoc in Hungary, belongs to the same floristic complex.